Product – Our bed loft is constructed with heavy duty gauge steel and always coated with the most advanced powder coating technology. It is very sturdy and sets up in a matter of minutes! The height and length can be made to the schools specifications and will always be manufactured so that it can be “bunkable” if the student chooses. The bed loft is being manufactured with the highest quality standards and recent manufacturing equipment in a brand new facility. Our product is proudly “MADE IN THE USA”. Programs – Collegiate Concepts can set up a variety of different programs for your College or University. The following are a few of the programs that are available….. Direct Rental Program – CCI works with the school or Student organization to obtain mailing labels for a summer mailing to incoming Resident hall students. We do the mailing to the students and accept orders directly from the residents. 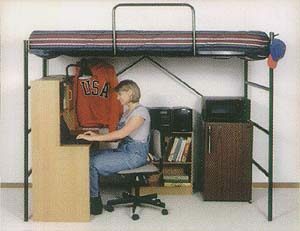 We compile the lists and make arrangements to distribute the bed lofts to those students on your campus. Under this program the only assistance we would require would be to obtain mailing labels and assistance from the school or organization for parking on campus and access into the halls for distribution. Typically this program would be the most expensive for the end user (the student renting the loft). Bulk Rental Program – CCI would supply the school or student organization with all the necessary marketing material at no charge and you would do the direct mailing to the resident hall students during the summer. You would be in charge of handling all the money and compiling the list of renters. After you have compiled the list and know the number of lofts that you will require, CCI will ship the lofts directly to the school and you would be responsible for distribution to the residents. Basically, under this program, CCI would not be involved other than supplying you with marketing material and assisting with any promotional material or ideas. Typically, this would be the least expensive program to the school or organization. The cost to the end user (student renting the loft) would be left up to you. Combination Direct / Bulk Program – CCI and the organization would work together to split responsibilities. For example: Maybe the organization does not want to handle any of the orders or money. CCI would pick up that responsibility and handle all of the mailings and collect all of the money. Another example would be that maybe the organization doesn’t want anything to do with the initial distribution, but is willing to assist with later orders and cancellations. In this case CCI would handle the initial distribution. We can work out virtually any scenario that you may require. Generally, under this program, the cost to the organization and the end user, is somewhere in the middle. Custom Made Program – This is exactly as it’s stated. We will work with you to custom build a program that fits your situation and your goals. Satisfaction Guaranteed! Regardless of what program fits your needs, CCI will always stand behind our product. If a student is ever unhappy with the product for any reason, we will gladly replace the unit or refund his/her money without any questions. Quick and easy to assemble! View our step-by-step instructional video.